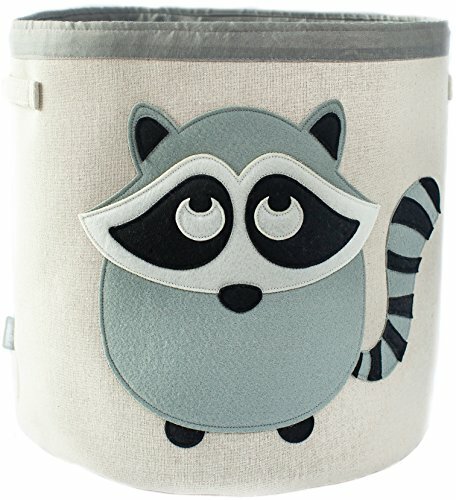 Woven of rugged jute canvas with sewn-on animal design, our collapsible kids' storage bin is much sturdier than most. Large 15" x 11" size holds toys, diapers, clothes & more. Forget skimpy cotton & chintzy plastic. This premium storage basket comes in heavy-duty jute canvas, tightly woven to resist hard wear. What's more, its adorable animal design is sewn on (not merely printed), so it won't easily fade or fall off. Bottom line? This durable toy bin will stand up to just about anything those little cherubs can dish out. Plus, it's so cute & colorful your tots will love filling it with toys. Imagine... your daily clean-up time can actually be fun, not a chore. Sturdier Than Most: Forget flimsier fabric toy bins that easily wear out. Your Grey Bee woven storage basket comes in heavy-duty jute canvas, tough enough to take whatever your tots dish out. Premium Sewn-On Animal Design: Unlike cheaply printed storage bins, this better-made basket boasts a colorful applique' critter, carefully sewn on & reinforced with durable double stitching. Incredibly Versatile: Your 15" x 11" storage unit will come in handy for years to come... as your children age from babies to toddlers to preschoolers & beyond. Use it to store diapers, toys & more. 100% Guaranteed: We're sure you & your youngsters will enjoy your new canvas storage container. But if you're not happy, return it anytime for a full money-back refund... no questions asked. If you have any questions about this product by Grey Bee, contact us by completing and submitting the form below. If you are looking for a specif part number, please include it with your message.